My first choice was Star Wars. With every new release, Star Wars fans take to Twitter and other social media to broadcast their ranking of the movie series. However, while Star Wars is popular with plenty of published ranked lists, there has also been a consensus that has developed and I suspect any voting method will quickly coalesce around Episode V: The Empire Strikes Back as the favorite. Also everyone is wrong, Return of the Jedi was better. Fight me. But then Business Insider came out with a very-belated ranking of Black Mirror episodes and I realized this was the perfect example. While not as popular as Star Wars, Charlie Brooker’s Black Mirror (on Netflix, and before that Channel 4) is composed of 19 distinct, standalone episodes. Every episode includes some elements of techology bringing on dystopia in the near future, while at the same time featuring entirely different stories, characters, casts, and often directors. Viewers are fiercely opinionated, there is no consensus canon, and every ranked list is wrong except this one1. Fight me. The Black Mirror subreddit has a dedicated thread for users to post their episode rankings. I manually recorded the rankings from 111 users, considering every top-level comment that provided any sequential order of episodes, only excluding posts that were clearly ranking only episodes from a limited number of seasons (often seasons 1-3, or just season 4). This includes ranks from 11 different articles as compiled by reddit user loonwin. I have made the raw recorded data availible on github. The data is particularly unique because many users did not make a full ranking of all 19 episodes, with some users ranking just a single episode as their favorite. This is something that could happen in an actual ranked-choice election, which brings us to the subject at hand. The top rank for every voter is counted, and the option with the fewest top ranks is eliminated from the pool. If Return of the Jedi was eliminated, the ballot above would then be counted as a vote for The Force Awakens. But what if a voter didn’t rank every option? If all of their choices are eliminated the ballot is exhausted and will no longer be counted. Notably, Shut Up and Dance and The Entire History of You both recieve more 1st place votes than San Junipero. This is a particularly egregious miscarriage of justice as not only was San Junipero the winner of the Primetime Emmy for Outstanding Television Movie, it was also this author’s #1 episode while Shut Up and Dance was 19th (reminder: there are only 19 episodes. Also The Entire History of You is great, it was 7th in my list). While every episode has an incredible range of responses, White Christmas is so far ahead of the rest that we’re going to make a special comparison of all episodes not starring Jon Hamm to round out the top four. Sorry Jon. Every ballot ranking White Christmas first will instead be counted as a vote for the episode ranked second by that voter. We’ll illustrate that with a Sankey diagram. Interestingly, we still have the same top-3 after removing White Christmas. Shut Up and Dance leads with 18% of the vote, followed by San Junipero and The Entire History of You with 16.2%. Shut Up and Dance tells the story of a teenaged boy who stumbles into being blackmailed partly by ignorance, but mostly by his sunk-cost fallacy that there is no way for him to back out at any given point. Did I mention it’s not my favorite? The Entire History of You, on top of having a super long name that ruins my chart labeling below, tells a fascinating story about the implications of having perfect memory, and if human relationships could really survive such an advancement. San Juniero is essentially a romance of unlikely lovers that never would have met without a new technology. No option is anywhere near a majority of the vote, and currently a terrible choice2 is leading the pack so this looks like a perfect place to implement ranked choice voting. But ranked-choice voting will give us a window into whether San Junipero is not well liked among Black Mirror fans, or if the lower ranking is driven by a minority of voters. In the first round the episode with the fewest first-place votes will be eliminated, and those ballots will be reassigned based on the next highest ranked option still availible for that voter. In this case that will be four episodes (Arkangel, Crocodile, Playtest and The Waldo Moment) all recieving just one first place vote. Note that Metalhead and Men Against Fire recieved no first-place votes, and have already been eliminated. A few things to note after the first round. The voters who ranked Crocodile, Waldo, and Arkangel as their favorites had their votes moved to their second-favorite episodes (The Entire History of You for the former two, Be Right Back for the latter). Also the sole voter who loved Playtest refused to rank any other episodes as back-up options, so their vote has been removed for all future consideration. By not ranking more than one option this voter actually reduced their ability to influence this election. Are you following? Let’s speed through a few more rounds of elimination. So in narrowing the field of episodes down to 5 we see our first example of a strong coalition. Be Right Back is eliminated and well over half of those votes go to San Junipero, propelling it into the lead for the first time. Be Right Back is another episode (like San Junipero) primarily focused around a romantic relationship, which is rare in the Black Mirror universe. So it makes sense that the users who liked Be Right Back also ranked San Junipero higher than more unnerving or non-romantic episodes like Shut Up and Dance, White Bear, or Fifteen Million Merits. Next round we’ll see the elimination of White Bear and followed by (barring a radically skewed, coalition-type redistribution) Fifteen Million Merits. Lovers of White Bear broke predominantly for San Junipero. As a result Fifteen Million Merits was eliminated and those votes were split fairly evenly among the remaining three episodes. The ultimate victor will come down to the preferences of voters that have (so far) supported The Entire History of You, an episode that both focuses on a romantic relationship and its inevitable, destructive collapse driven by dystopic technology. So there are similarities to both of the remaining contenders and the margin between the two lies at just 4 votes. San Junipero picks up just over half of the votes from The Entire History of You, as more reddit users prefer San Junipero over Shut Up and Dance. 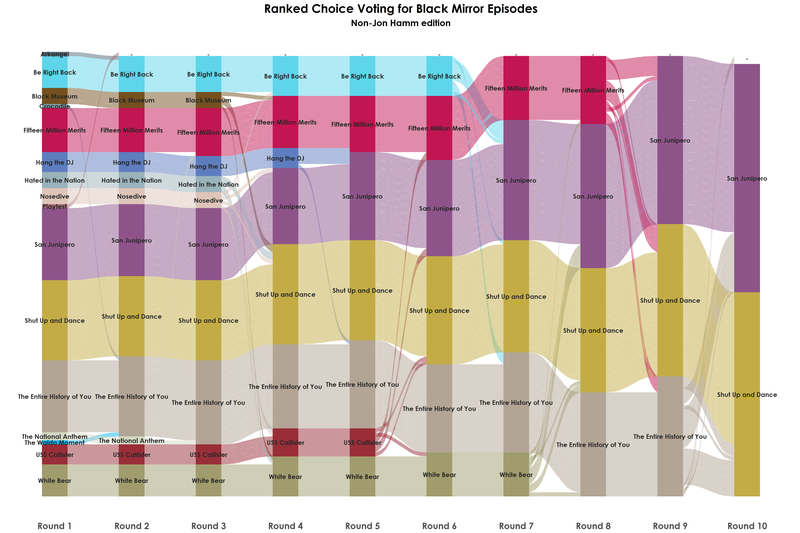 By crossing the threshold of 50% of all (eligible) votes, we can safely declare our ranking-crisis averted and San Junipero to be the (second) BEST Black Mirror episode of all time! If you’re interested in this analysis, you can find the raw data plus code for analysis and visualizations on GitHub. In addition, I have a separate post on this blog walking through making the Sankey diagrams using the ggaluvial package in R.